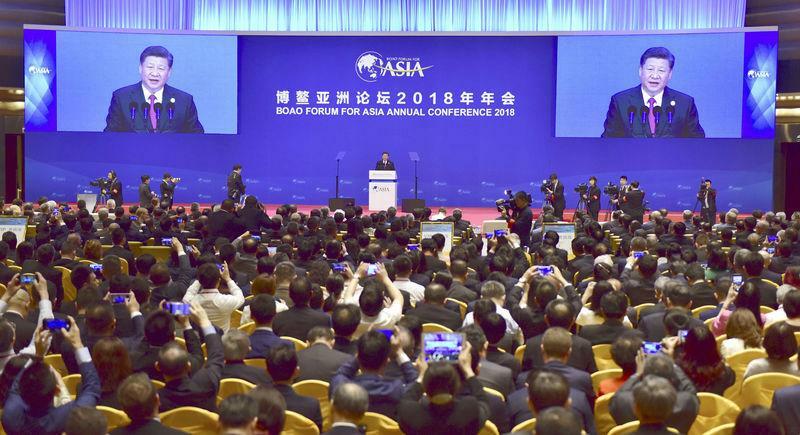 BOAO/BEIJING, China (Reuters) - Chinese President Xi Jinping promised on Tuesday to open the country's economy further and lower import tariffs on products like cars, in a speech seen as an attempt to defuse an escalating trade dispute with the United States. While much of his pledges were reiterations of previously announced reforms that foreign businesses say are long overdue, Xi's comments sent stock markets and the U.S. dollar higher on hopes of a compromise that could avert a trade war. Xi said China will widen market access for foreign investors, addressing a chief complaint of its trading partners and a point of contention for U.S. President Donald Trump's administration, which has threatened billions of dollars in tariffs on Chinese goods. "President Xi’s speech appears to have struck a relatively positive tone and opens the door to potential negotiations with the U.S. in our view. The focus now shifts to the possible U.S. response," economists at Nomura said. Xi said China would raise the foreign ownership limit in the automobile, shipbuilding and aircraft sectors "as soon as possible" and push previously announced measures to open the financial sector. Vice Premier Liu He had already vowed at the World Economic Forum in January that China would roll out fresh market opening moves this year, and that it would lower auto import tariffs in an "orderly way". Xi said China would accelerate opening up its insurance industry, with Shanghai Securities News citing a government researcher after the speech saying foreign investors should be able to hold a controlling stake or even full ownership of an insurance company in the future.